We have been talking about recycling in class and we have been using our grey and green bins every day. 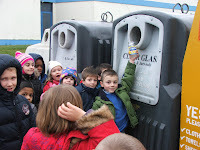 Yesterday we went to the bottle banks and we saw the banks for the different coloured glass bottles. Teacher brought some glass bottles with her so we put them in the right banks. We had one juice tin so we put that in the bank for tins. We saw a bank for old clean clothes there too. Back in class Leah showed us her lunch bag which was made from two recycled plastic bottles.